14 Hours is a film noir from director Henry Hathaway and a screenplay by John Paxton based on a story by Joel Sayre. The story revolves around a police officer played by Paul Douglas and a man on a ledge threatening suicide played by Richard Basehart. This story starts with our police officer on the street giving out parking tickets when he notices a jumper on the ledge of a hotel. He goes up to talk to him and is the first cop on the scene. He talks to our jumper for a bit before the higher-ups get there and tell him to go back down on the street. Our jumper soon says he will only talk to the original police officer so they go and find him on the street and bring him back up to the ledge. Will our hero flat foot cop be able to save the day and talk our jumper down? Why is our jumper on the ledge? Barbara Bel Geddes shows up as our jumpers girl and Agnes Moorhead also stands out as the over bearing mother of the jumper. We also get some minor stories from the people down on the streets of New York. This shows the effects of this spectacle on those folks. One of these small sub plots is what made me so excited to see this. 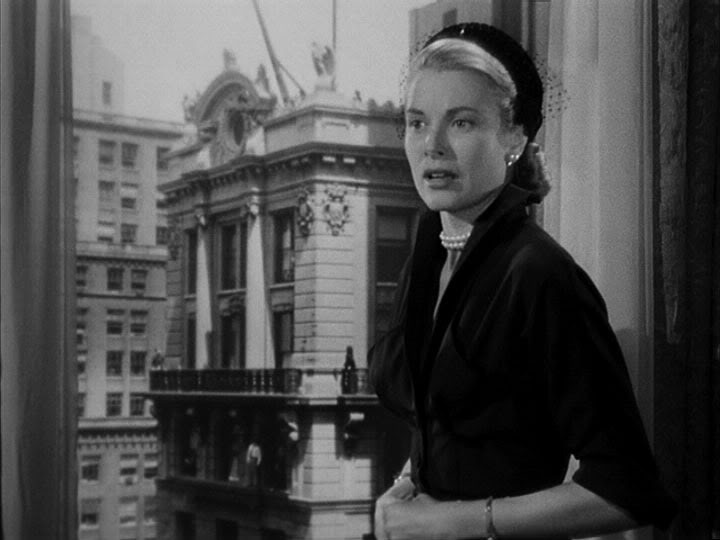 We have Grace Kelly in her first film role, as a wife on her way to a lawyer’s office. We see flashes of future brilliance here as the jumper has blocked traffic and made her late. Then as she is across the street in the lawyer’s office she can see the jumper on the ledge out the window as she waits for her meeting to start. I don’t know how I missed this film with her in it. I went through a Grace Kelly phase after seeing Rear Window for the first time and had to see everything with her in it. This one slipped under my radar some how. I guess I still am in a Grace Kelly phase, but who isn’t? Another sub-plot is the taxi drivers who are basically stuck in traffic and out of work for the day. We also have a young women who would like to help but doesn’t know how. The way this was filmed is really well done. We have some great shots from the street up to the jumper and some from high up in the building down to the crowds on the street. It has some very interesting cinematography worth checking out. This is a slightly above average film and average film noir worth watching for Grace Kelly fans, even if it is a small role. Classic noir fans will like it as well and those wanting to see what New York City looked like in the early 1950’s. Favorite Tidbit: Though 2012’s Man on a Ledge is not a remake, it does have a lot in common with this film. Both take place in New York on a hotel ledge. I also noticed a lot of the same quotes and similar actions of the New York crowd on the street. Man on a Ledge is also a very good film I will have to re-watch and review it soon. What a cast! Even some of the bit players became famous (e.g. John Cassavetes).